The flight from Amsterdam to Jakarta is 16 hours, but it feels even longer when you know you have to fly right back. I was on the hook to present a research project on growing bell peppers to the Minister of Agriculture. I was expected to renew its funding. But we knew that the 600,000 EUR pilot project only managed to get 2 farmers involved. And we knew that the project had sold exactly zero bell peppers. The engineers said they’d done their job, and it was up to the economists to find the marketing plan, except the lead economist had just disappeared. So a day before, they’d dumped this hand-off on me, a junior researcher. The technology worked. Automated greenhouses grow things faster, better, without chemicals. But Dutch agriculture technology always works in the case of Holland, not necessarily abroad. So, making a greenhouse business work in other places requires more than just engineering. Which is why the government invests a lot in exporting Dutch agricultural technology with projects like this. Indonesia is roughly the size of Greenland, but with a population of 250 million, and half their economy is agriculture. The pilot had some wins to show on the engineering end; it produced bell peppers. On top of that, it made a great case for investment, at least on paper. Greenhouses are a big up-front cost, but because bell peppers are a delicate crop with a limited shelf life, they promise high margins. But we knew that Indonesians don’t eat bell peppers. And we knew that Indonesia didn’t have the transport infrastructure to cost-effectively distribute any kind of pepper. Sambal hot sauce is the pride of Indonesian daily cooking. It’s made with chili peppers, for which Indonesia’s climate is perfect for growing. But because production is scattered over Indonesia’s 17.508 islands, it’s cheaper to import chilli peppers to make sambal. There are always formal protocols for handing over projects between governments. This one would be handed over at a closing ceremony at the Ministry in Jakarta. A U-shaped table in a formal meeting room would be setup, with seats assigned with name tags, and a jar of water and breath mints to be shared by each pair of attendees. The Minister would kick-off the meeting with a welcoming, followed by the representing foreign diplomat, in this case the agricultural counselor, with some words on the strength of collaboration between countries. The project leader would present some of the activities, and results. In his wake, the 2 farmers who participated in the pilot project, would say a word of gratitude about the grant they received. Then the senior government representatives would ask questions, and discuss the project. They’d reserve their decision on whether or not to renew it for a written response later. After the formal discussion ceremony, the Minister would leave for a next obligation. For the rest of the participants there would be an informal walk-about exhibit, showing the tangible technology accomplishments of the project. The ceremony is organised like this to empower the Minister to make the best decision possible. In principle, the discussions question the merit of the project itself, and the Minister should have clear knowledge of the project’s effectiveness before deciding. But there are other factors for the Minister to consider too — government budgets, policies, diplomatic relationships, etc. — so this process also allows the Minister to make this call discretely, later, outside of the room in which the ceremony dynamics take place. Every stakeholder that is responsible for the project is present in the meeting minutes, but only the most senior representatives speak. This is to respect seniority, but usually they haven’t been too involved in the project itself. They’re also all incentivized to continue the funding. For the university, it’s more money to keep staff. For the Indonesian government, it’s to keep foreign relations and continue receiving the benefit of foreign investment. So the discussions and questions stay at a high level, to remove the potential sting of contradictory details or stepping on the wrong toes. This also creates insurance that should the Minister’s decision backfire, the responsibility lies with the stakeholders that were present. So everyone knew that no hard questions would be asked. Which is why in spite of the fact that the pilot didn’t work, the university expected the project funding to be extended. I had been briefed on all of this, and told exactly how much was riding on successfully extending the funding. This could mean another 600,000 EUR to keep 5 of my colleagues working for 4 more years. Or not. The first clue that the Minister wouldn’t show up came on the agenda that was circulated the day before. There was an asterisk beside his name. But he appointed someone from the ministry in his stead, and the ceremony proceeded. No difficulties were mentioned during the presentations. Throughout the polite exchanges, and even in the informal discussions afterwards, raising them would break protocol and instructions from the university. After the ceremony, we all shared goat satay and a few bottles of Bintang beer, and I was on the flight home. The Minister decided to extend the project for another 4 years, with the explicit request to scale up adoption of the greenhouse technology for bell peppers. Eight years later, the project continues, but still no reports on bell pepper sales. Putting a discussion on the agenda doesn’t mean a meaningful exchange of knowledge happened. The example above seems like an extreme case, but it’s actually common. It’s not just formal procedures — the same oversights happen at conferences, universities, startup accelerators. Even the most “interactive” workshops often fall into the motions of energetic discussions and activities, and still fail to make deeper educational impact. 1. Take a hard look at what you’re doing now, and spot weaknesses or disconnects from the learners perspective. 2. Make it clear which areas to improve next. To support this type of evaluation, we’ve created the Peer Learning Pyramid. It’s an evaluation model for any peer learning environment that reveals its strengths, inconsistencies, as well as appropriate next steps. Responsiveness — the program’s ability to systematically assess and provide knowledge as and when it is needed. At first, that means getting the learners’ goals and questions up-front, and at a more advanced level, it requires diagnosing each learner before they begin. Programs start by becoming more responsive when the education content is calibrated to learners’ needs. Ultimately, responsiveness takes form as a diagnosis through mentoring conversations with the learner. Agency — flexibility given to the learners in deciding their learning outcomes. This starts with inspiring and empowering the learner to self-direct, and then builds on that self-direction by switching to a supporting rather than directing role. Agency evolves from a push by the educator to shape the learner’s mindset, to pull-based learning, where the learner takes full control. Hyper-connectivity — being able to make meaningful connections that jump outside of the learner’s network, to the most relevant sources. This starts with brokering select connections on the learner’s behalf, and evolves into creating environments where they can make those connections instantly by themselves. Opening up connections to expertise for the learner takes active introductions by the program, but when learners are fully self-directed, connections come through facilitated encounters. Hyper-connectivity, or systematically connecting learners to others on their path, only makes sense when they have a path. That means they have Agency within their learning environment, but also that the program itself is designed to listen and respond. 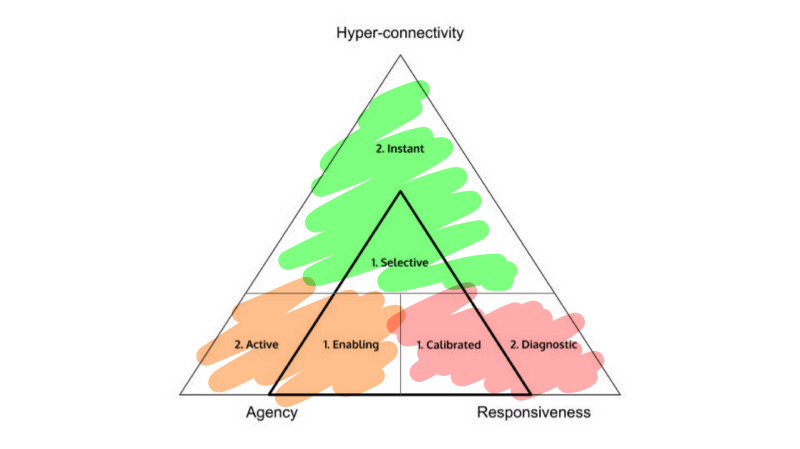 So Hyper-connectivity depends on a foundation of Agency and Responsiveness. So the PLP is a stacking pyramid. It shows you how to build the foundation first, and then build upwards. In many cases, we see the promise of an educational event fail because it makes connections but assumes it knows the learners’ goals, or allow the learner to act effectively. By assessing an education program on each of these factors, it helps us see if we’re going through the motions without effect. It helps to determine if relevant learning actually takes place, and if not, how to fix it. Lecture-driven programs excel at topics where the learner needs little input into their learning journey. They typically don’t sense learners’ needs or adapt to them, connect them to other experts than the lecturers, and give little or no agency to the learner regarding the topics. For topics and disciplines that don’t change much, this inflexibility allows the lecturers to improve their delivery through practice, and polish their content over time. But in faster-changing situations, choosing lectures as the default education format is a liability. Lectures become ineffective when they’re not relevant to the learners current challenges. Learners tune out. This is the cause behind lecturers concerns about creating engagement in their classes. Lectures are typically one-way education, but sometimes lecturers start by asking the students questions, either about what they want to learn today, or assessing them with a show of hands. This is a form of Calibration, so on the PLP, we can rate Responsiveness at Level 1 (Calibrated) in these cases. However, lectures don’t enable learners to decide how they would like to achieve their learning goals, so we rate them at Level 0 (No Agency) for Agency. 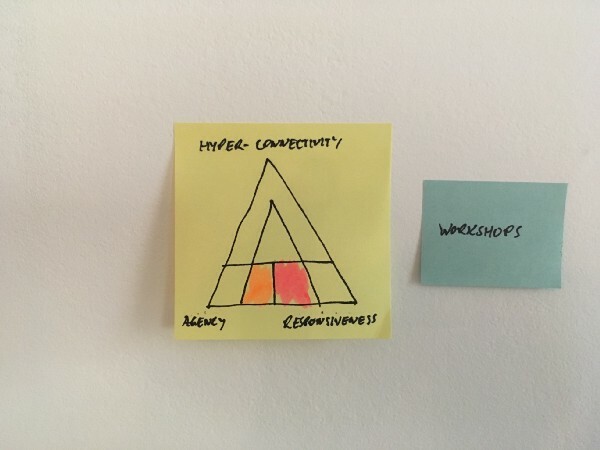 They also don’t involve other experts to address these needs, so we evaluate them as Unconnected — Level 0 on the Hyper-Connectivity scale. We can see why lectures leave much to be desired from the learners perspective, and also how to improve them. Quick wins lie in becoming more responsive; what about doing a post-up for the questions tied to today’s lecture to get a sense of who’s struggling with what type of issues? Or, if the class is too big for a post-up, how about sending out a quick online survey to participants before the lecture? If a few students have relevant projects, why not bring them to the podium and work with them or coach them, for all to benefit? All these types of actions will help the lecturer to collect an impression of what’s on the mind of learners as a form of preparation, and put emphasis on those particular topics. The idea behind the panel discussion is to get a good conversation going between experts, to flush out the most relevant topics of the day. The reality is that most panels become a set of small talks, with each panellist pushing a pre-determined agenda, or responding to the moderator’s set of irrelevant questions, which are actually just meant as fall-backs. Panel discussions often result in some guy rambling on about something irrelevant to the audience, and are consequently the subject of scorching commentary in the back channels where the event is discussed. Many panel moderators don’t like to involve the audience, and they have good reason. Audience questions are often irrelevant, or they “like to state a point related to the topic, rather than asking a question”. Audience involvement is seen mostly as a distraction, and because of it, panel discussions restrict learner participation. Let’s look at panels from the learners perspective. Panel discussions do tend to attract learners with clear learning interests. They recognise the experise of the panelists, usually because they are aware of the state of the art, and sometimes because they are working on their own projects. But, contrary to this high level of learner agency, the panel format leaves learners powerless to express themselves, or direct the discussion to something meaningful to them. On top of that invited panellists are usually outsiders, either from a different place or more progressed than their audience, which makes the divide between panel and audience even bigger. This is frustrating for learners. So when it’s question time, both the frustration and the built-up pressure to try to learn something relevant, turn Q&A’s into the crazy spouting pressure release valve phenomenon that panels are notorious for. The problem isn’t the audience, it’s that they haven’t been given a voice except for a short question right at the end. The situation is frustrating for panelists too. They’ve been put in a format that creates an antagnistic exchange, so they naturally choose to hide out in the speaker lounge after the session. How do panels score on the PLP? Well, they fail to make a mark on Hyper-Connectivity, because they don’t facilitate the creation of relationships with the learners (Level 0, sorry). Do the learners have the opportunity to specify the topics of discussion, other than asking a question? Does the learner have any say in how to interact with the expert? No to both, hence zero’s all around for Responsiveness (Ignorant), and Agency (No Agency). Targeted calibration on questions learners create more engagement. Could you find specific challenges amongst them to be discussed by the panel? Did it start with any attempt to assess their learning goals, or even understand why they are in that particular room? So, what if instead of putting the panelists on centre stage, we consider a challenge that a learner might have? When the learners’ goals are visible to all participants (both audience, and panelists alike), it’s likely that the panellists won’t be the only relevant experts who have something to contribute. The audience includes people with local experience who are more empathetic to the goals and assumptions of learners and their priorities. Putting the learner in the center now creates unity amongst the interests of all participants, and provides a more constructive learning context overall. Panels will benefit a lot if their Responsiveness is increased by activities that identify people who have relevant issues for the whole group of participants to discuss. If you’ve ever had the opportunity to experience a conference of thousands or tens of thousands of people, you’ve probably left with a sense of awe or excitement. Large conferences are a unique type of learning experience because of who you can meet. They attract a broad, diverse group of people with some common interest. The potential is in the people you meet, who you’d probably never discover otherwise. In order to deliver on the promise of bringing people together, conference organisers need to attract a crowd. The way they draw in the crowds is by committing big name speakers to the event. Yet, despite the crowd being present, the success of a conference is still fragile. If the talks are bad, the participant feedback for the conference as a whole will reflect that. On top of this, a substantial part of the conference attendees leaves the conference without really having gotten to meet anybody new at all. Conferences hold a promise of hyper-connection, but that can only be delivered if the conference were to be more responsive. The freedom to shape the agenda is an issue. How can you give more control to the participant to shape their own program at the conference, and actually help them succeed in meeting relevant new people? The PLP reveals where this risk to success of a conference comes from. Because so many people with common interests and challenges are drawn together, the Hyper-Connectivity potential is Instant, with a maximum rating of 2 — there could be almost no delay for the learners to find highly relevant people to their specific learning goals. But, because conferences are designed around the speakers, this is where misalignment with the learners’ needs happens. Even at conferences that promote themselves on who you meet, the physical space induces people to find a seat in a dark lecture hall, listening to a speaker, not engaging with like-minded people. The content for the talks themselves are also set by the individual speaker, not the learners. At their best, the talks are informative. As a result, peoples’ time allocation for the conference is imposed on them. This centralised control over the setup of the program make Large Conferences ignorant (Level 0). The only agency Large Conferences allow to the learner is selective (Level 1) — to choose which talks to attend (or not). They don’t allow the learner to specify, direct topics, but still push the learner to curate their own learning in some way. No wonder everyone always looks forward to the coffee breaks in the program! Thus, although conferences promise Hyper-Connectivity, they offer little to participants to support it. And, the paradox of the conference is that all the talks actually prevent people from meeting. So while conferences have the potential for connecting everyone to deeply relevant people, what we call instant hyper-connectivity, this systematically fails because the underlying levels of responsiveness and agency don’t support it. 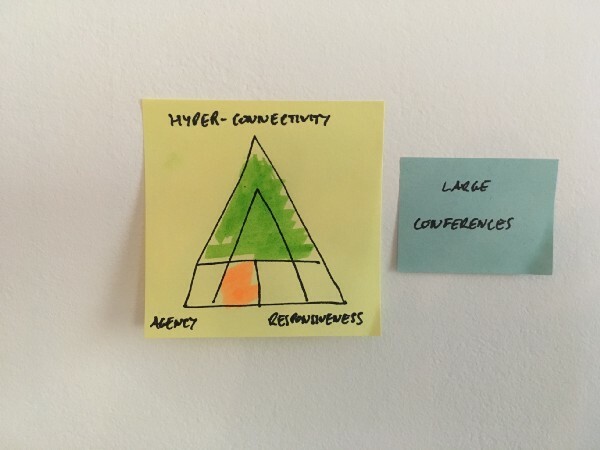 Unless conference organisers start relinquishing control to the attendees, providing ways for people to share their agendas and the time and space to start relationships, they will not realise the promise of Hyper-Connectivity. Learners need to have a say in how they interact with the vast expertise around them. Also they need guidance to connect with the right people at a conference. So, rather than attempting to feed them with speaker content, efforts should focus on facilitating connections. A big step towards this are the options to break out into smaller groups that participants can choose from. If the issues that are addressed in those groups are diagnosed, and show a significant levels of representativeness for current concerns of the community at large, the learner will be able to find their way to the relevant wisdom she needs. 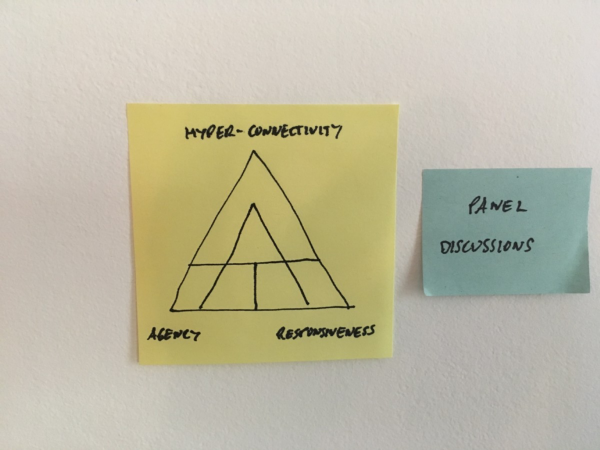 Only by increasing Responsiveness, and building on the Agency in the room, will Hyper-Connectivity be achieved. Over the last decade, the conference industry has grown and now largely competes on size rather than content or quality. A response to that is the emergence of smaller retreats, where a group of less than 20 people are chosen to meet in a comfortable, secluded environment for a few days. Retreats are usually quite unstructured, allowing the participants to bring their own agendas and start meaningful conversations. They are good examples of creating environments that build on Agency. If you’re invited to a retreat, you’re expected to be self-directing and proactively make use of the opportunity. That’s why they rate a level 2 (Active Agency) on Agency. Being loose on structure has its benefits, but it also comes with problems. Retreats rarely include systemic opportunities for needs to be expressed. With the most pressing needs unsaid, a lot of time is wasted in awkward social interactions and days of “getting to know you” before the deeper knowledge exchanges take place. Retreats suffer when little effort is made to ensure that the group itself is selected so that each participant meets the most relevant people possible. Participants tend to only find someone great, right at the end. 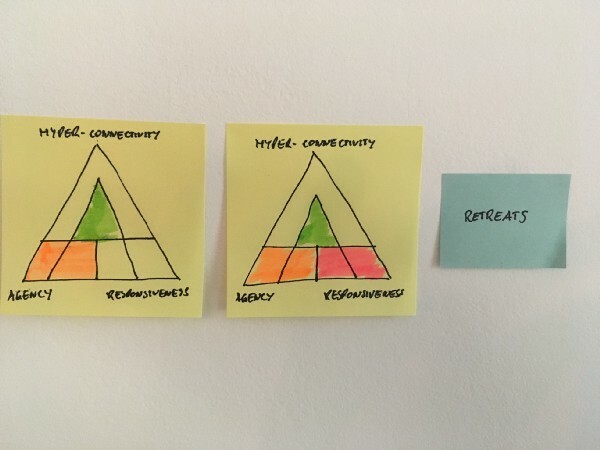 If there’s no built-in way for each participant to share their goals, then the retreat would rate as Ignorant (Level 0) on the Responsiveness scale. But if the host takes the time to understand and diagnose each partipant beforehand, they’ll be able to start everyone off with curated introductions — that’d rate as Diagnostic Responsiveness, level 2. What talents do they have that are relevant to the rest of the group? How can you use that talent to increase connectivity? 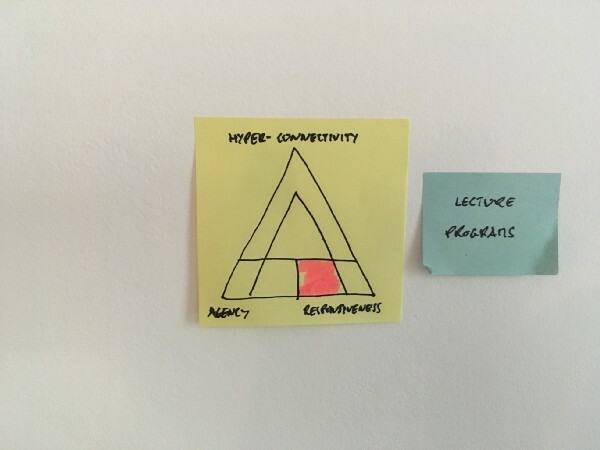 A minimal amount of effort is required for a retreat organiser to select people who will gain from each other, so a level 1 (Selective) on the dimension of Hyper-Connectivity. A first intervention to improve a retreat program would be to perform active curation to balance the mix of participants with a diversity of perspectives, and experiences. The mix of people then becomes the ingredients for the learner to successfully achieve her outcomes. To improve Responsiveness, retreat hosts can help participants open up to each other. This isn’t just about stating clear, logical learning goals. For people to open up and share their dreams and fears, they have to feel safe and welcome among their peers, in an empathic atmosphere and a familiar culture. This way, it will take less time, and social awkwardness to understand how to start meaningful exchanges with another participant. Lastly, the implicit rule of a “retreat” is often to relax and socialise only. But if a participant has a rare, face-to-face without someone who can really help them, then rolling up their sleeves together on “some work” might be what’s badly needed. Creating an environment that enables this to happen, both practically and socially, provides a systematic deep response to those critical learning opportunities. Workshops tend to address a smaller audience than lectures, which allows the lecturer to interact more. Well-delivered workshops feel more like getting things done than just learning. The teacher can ask questions, check in, adapt a bit. The learners questions improve because they’re prompted from their experience, putting their learning into their context. So how do workshops score as a peer learning format? Workshops are a great example of the power of Responsiveness. Sometimes, workshops start with a clear question: “what would you like to learn today?”. Other times, it’s more subtle, as the teacher progresses, they ask questions, “Have you heard of this? Has anyone done this before?”. These dynamics make workshops to be quite responsive. There is time, and space to delve into specific questions that a learner might have. Responsiveness of workshops is generally at Level 1 (Calibrated) because the learners can request topics or changes in pace, even if their needs aren’t diagnosed. What would happen if learners started requesting the specific content that they needed, as they need it? When workshops are planned on a preset path, they give little agency to the learner in terms of specifying the topics covered. Learners do get to ask questions, but within the limits of the preset workshop topic (set by either the program manager, or a workshop facilitator; not the learner). It’s a missed opportunity when an expert practitioner can just work with a learner, exposing really useful tips, ways of working and attitudes to work in practice — none of which are visible in the artificial exercises that usually get planned. Even so, workshops build confidence in learners and enable them to become self-directed. They enable Agency, so rate 1 (Enabling) in that dimension. Common interventions to improve workshops are to increase Responsiveness by being on the look-out for topics that emerge within a group of learners. Ensuring that the workshops address those topics means that those topics address the learners goals at right time when the learners actually need those answers. To maximise Responsiveness, workshops need to shift from prescriptive to diagnostic. Rather than plan specific content, they need to plan to bring in the learners’ projects and challenges, and educate around those. That can be as simple as planning for learners to “Show & Tell” their project to the class, followed by the workshop expert working with them on it. Startup accelerators typically support a set of startups with similar goals and a similar stage. They lay out a 3-month program that includes a pre-defined educational path with workshops on general startup topics like raising investment, product design, learning from customers, and marketing. Accelerators also provide a group of mentors, who support the startups with advice and connections. Accelerators tend to score Level 1 (Calibrated) on Responsiveness. They constantly check in with the startup teams to monitor progress, and ask about their big questions. But they tend to be prescriptive about the challenges each company faces, and if there are individual diagnostics, those are done by individual mentors who have little say in redirecting the program. Fundamentally, accelerators schedule their educational programs before selecting the startups they support. Acclerators typically respond by brokering a few select connections and introductions for startup teams via their network. Those select connections take time, so we can rate accelerators level 1 (Selective) on Hyper-Connectivity. 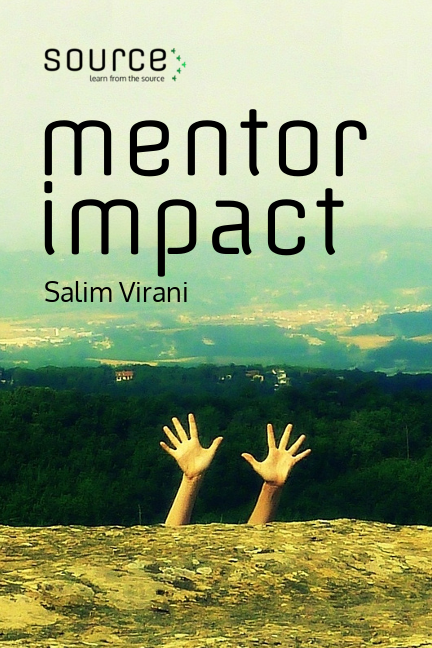 What if you started a culture of mentorship that encouraged referrals? Who would be attracted if you opened up parts of your program to outsiders? 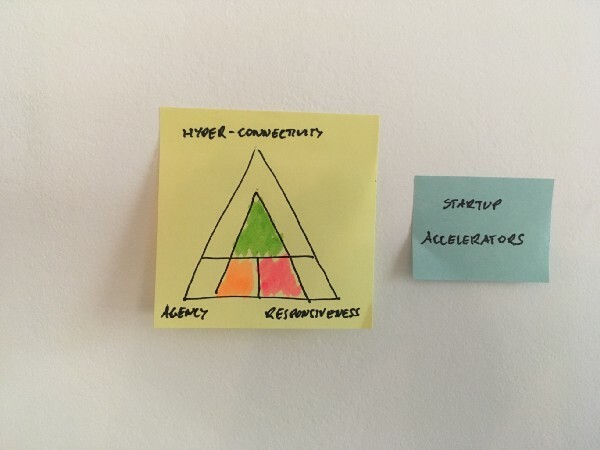 Agency is constrained to the goals of the accelerator program, because it will only respond within the boundaries of the program’s predefined goals (Level 1: Enabling). If the accelerator is funded by investors, the learners goals are constrained towards another investment. If it’s funded by a corporation, their goals are constrained within that corporation’s strategy. Because of the politics exerted by the investing partners behind accelerator programs, accelerator directors often feel an urge to increase control and keep their startups on the program’s target, rather than relinquishing further control to the teams. There is an inherent conflct in increasing control in accelerator programs. It turns them into compulsory schooling exercises rather than company leaders who set their own agenda. When capable founders start to take charge and control their time, they’re treated as delinquent students and berated for truancy. Despite the behavioral tendency for control in accelerator programs, many accelerator program managers, and directors recognise the inherent conflict. They see that it doesn’t make sense to plan content for the duration of the program, since the immediate needs of each startup will be different. An approach that can cope with the diversity of stages, and emergent nature in the development paths of startups helps here. An easy step is to put placeholder dates in the program for workshops, dinner talks, and other events. Scheduling repeating placeholders makes logistics easier, since there’s no need to constantly schedule events. Scheduling interactive events, like AMAs (ask me anything), fireside chats and dinner talks, allows for the founders to choose topics. It also allows the accelerator to invite non-educators with more relevant experience to drop in easily. Clarity on them is created through calibration. Gauging progress with startups, sharing notes on them in a peer review setting, facilitating mentors to share their observations on progress, as an outside opinion, etc. These are all small acts of responsiveness that allow for more tailoring to what the teams actually need. Barcamps are open conferences, usually hosting several hundred people, that allow the participants to define the schedule. They follow a format called Open Space, which starts with everyone meeting in front of an empty schedule on a board. Everyone has the opportunity to present an idea of for a conference session in front of everyone, and add it to the schedule. Barcamps have gone through a global popularity wave, having been run in over 350 cities and the largest attended by 6,400 people. The session topics are always specified by the participants at Barcamps, and they tend to be more conversational than typical presentations. For the newcomers that don’t know how to catch the waves of opportunity at the conferences, you’ll see the more experienced participants guide new participants. 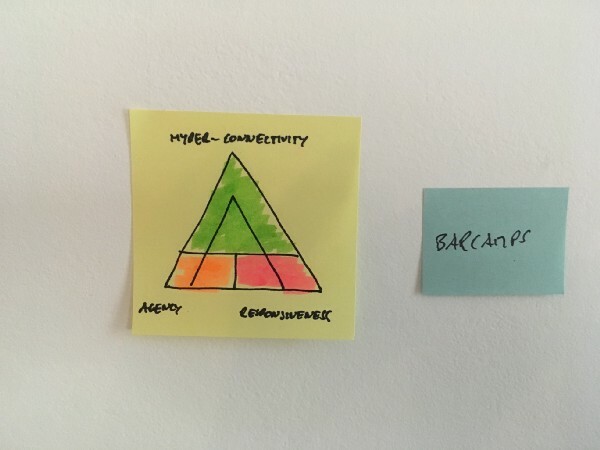 Experienced barcampers know how to make the most of it, and newcomers quickly figure it out, so Barcamps get full marks for Agency (Active). Although most Barcamp events are modest in size, they achieve similar results to much larger conferences. For one, they tend to attract socially-minded technologists, who by their nature are extremely hyper-connective. The tech community has a culture of “making intros” without asking for anything in return. This category of people also attracts a constant inflow new people to the community. At first Barcamps are overwhelming, because there are so many parallel sessions running, and walking into any of them usually means finding a room of helpful, like-minded people in mid-conversation. But this allows people to identify relevant new connections with people working towards similar goals but with different approaches, and form meaningful relationships with them. It all makes for a smoothly flowing swarm of people, and many leave the conference with relationships that they know will last them a lifetime (Fully Hyper-Connected Level 2: Instant). With this understanding, the PLP should give you a way to evaluate your own program, spot weaknesses and disconnects, and reveal what to do about them. We’d love to see you try, and talk to you about your evaluation and ideas. Please share yours with us, so we can understand how the PLP works, and give you some pointers if you’d like. (The dimensions you need to run your evaluations have been defined in detail in an earlier post titled “What is Peer Learning?”). If you’d like to read more as it comes in, please sign up to the Source newsletter. We’re sharing as we write!